Yep, I've branched out again. Last week with Martha, this week with Behr. I don't really have anything against Behr paint- I think it's a pretty great product- but the colors are generally too flat or too bright. 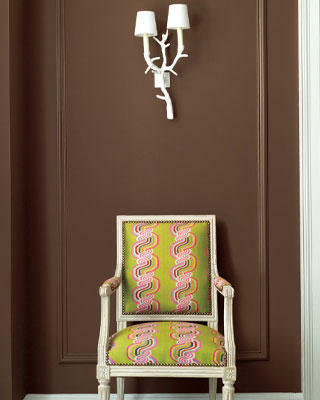 There's no middle ground- Except for this chocolate brown- Chocolate Swirl UL 140-3. When Trading Spaces first manifested itself about 10 or so years ago, I remember this room that sported a brown feature wall- and it was perfect- not too green, not too red. And I've been on an impossible journey since then to find this perfect shade. This is that perfect brown. It will go with anything and work in any room- just try it and see! Match it up with some blue, green, red, yellow, orange, or white- and it will look smashing. I am confident that this brown is the perfect problem-solver for whatever your decor issue may be.